Australia warmed up for their upcoming Twenty20 series against Pakistan with a comfortable seven-wicket win over the United Arab Emirates. Opener D'Arcy Short hit an unbeaten 68 as Aaron Finch's side eased past the UAE's below-par total of 117-6 with 23 balls to spare in Abu Dhabi. The first international fixture between the nations in the T20 format got off to an eventful start, as the UAE lost two wickets before scoring a run after opting to bat first. Ashfaq Ahmed and captain Rohan Mustafa both fell for ducks - the latter only lasting one delivery as he was cleaned up by Billy Stanlake - while Chirag Suri's departure for 13 made it 17-3 in the sixth over. However, Rameez Shahzad (22) and Shaiman Anwar, who top scored with 41, put on a 53-run partnership before Mohammad Naveed made a breezy 27 from just 13 balls in the closing stages of the innings. Skipper Finch fell early for one in Australia's reply, yet they rarely looked in danger of suffering a shock defeat. 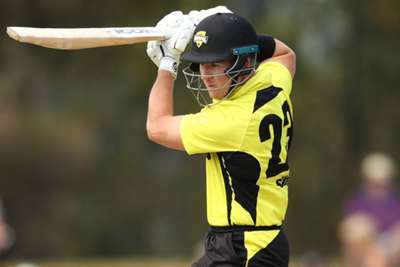 Chris Lynn (20) and Glenn Maxwell (18) were also dismissed, allowing debutant Ben McDermott - who finished on 10 not out - to help Short see the tourists to victory. Australia will be back at the Sheikh Zayed Stadium on Wednesday for the first of three T20 fixtures against Pakistan, with the other games in the series taking place on Friday and Sunday at the Dubai International Cricket Stadium.